Cherkess Mehmet Pasha, popularly known as Kaba Sakal — i.e., “twisted beard,” the torturer and former aide-de-camp of [Sultan] Abdul Hamid, Yusuf Pasha, Commandant of Erzerum, the Dervish Vahdeti, chief of the Jemiyeti Mohammadeieh, Hakki Bey, the notorious spy, and eight officers and soldiers who took part in the recent mutiny, were publicly executed at dawn. The Ottoman Empire in 1908 experienced the Young Turk Revolution, curbing the power of the sultan in a brief constitutional-monarchy era that would take the foundering state through the First World War. Unsurprisingly, the reigning, formerly-supreme monarch was nonplussed at this brake on executive authority. He backed the 31 Mart Vakasi, or 31 March Incident,* a counter-coup by conservative and Islamist elements in Istanbul to overthrow the Young Turks and re-establish the sultan’s power. Already the Porte was resorting to an assertion of Islamic political identity to hold the “sick man of Europe” together — and already that had resulted in some appalling atrocities. Once again, Armenian blood flowed. News of the revolt triggered an attack by Turks in the Anatolian city of Adana upon that city’s Armenian Christians. The resulting Adana Massacre claimed 15,000 to 30,000 lives throughout the Adana province. Indeed, the Adana massacre quite outlasted the counter-coup, resulting in going debate over the extent to which the Young Turks themselves blessed the pogroms. These guys had their own fraught relations with Turkey’s Armenians; of course, they’d eventually have the Armenian genocide to answer for. The mutiny collapsed with little effective resistance upon this Macedonian intervention, and the military had the run of the place — not for sack but for a severe clamp-down on the Islamic party. According to Nader Sohrabi, “some two hundred movement participants were hanged en masse, on row after row of scaffolds erected in public space by the order of military courts” in the crackdown. The 74 constitutionalist soldiers who died to put down the 31 March Incident are honored at a Monument of Liberty in Istanbul. * The Ottomans were on the Julian calendar-based Rumi calendar, so March 31 in Istanbul corresponded to April 13 in western Europe. Similarly, this date’s hangings took place on July 6, not July 19, per the local Turkish date. Early this morning this date in 1925, just hours after his condemnation for an eponymous rebellion against the newborn Turkish Republic, Sheikh Said Piran was publicly hanged. This founding member of the Kurdish anti-Ankara martyrology had sparked a momentarily-successful rising against Turkey, fired by grievances that have not ceased to resonate since. The secular nationalist Kemal Ataturk‘s intent to “Turkify” its peoples. The Kurdish populace’s frustrated national ambitions, indifferently bartered away by distant great powers dismembering the Ottoman Empire. * Ataturk’s abolition of the Caliphate. The February revolt quickly made him master of the majority-Kurdish eastern province of Diyarbakir, but a massive Turkish counterattack drove him east, encircled him, and had the Sheikh in irons by mid-April. The government arrogated martial law powers to itself and appointed Orwellian courts called Independence Tribunals to prosecute Kurdish elites, rebels or no. (Some Kurdish intelligentsia were hailed to Diyarbakir from Istanbul.) Hundreds hanged, without even counting wholesale extrajudicial retribution against Kurdish civilians. the repression of the 1925 rising was accomplished with a brutality which was not exceeded in any Armenian massacres. Whole villages were burnt or razed to the ground, and men, women and children killed. Despite prosecutors’ avowed intention to extirpate the separatist sentiment “root and branch,” it hasn’t exactly put the whole Kurdish issue to bed. Just ask Kurdish guerrilla Abdullah Ocalan, who received on this very same date 74 years later his own Turkish death sentence (since commuted). * A past-is-prologue artifact from the time: the “Issue of Mosul“, a prickly international relations dispute over control of the historic city, accurately suspected to be sitting on a lot of oil. Turkey claimed it as part of its historic heartland, but Great Britain had seized it just before World War I ended and wound up hanging onto it for the embryonic Iraqi state. Kurds who also considered it part of their homeland got short shrift altogether. It’s still disputed today among Iraqis, situated as it is just on the edge of Kurdish Iraq. On this date in 1926, 15 people who had been sentenced to death only the day before for attempting to assassinate Turkish statesman Atatürk were hanged in Constantinople. 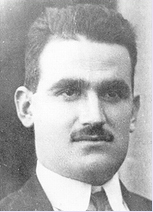 Ziya Hursit (English Wikipedia entry | Turkish), a former National Assembly delegate who didn’t see eye to eye with Atatürk, generally goes down as the ringleader in this affair. Frictions with said President had been growing over the preceding months, as Atatürk broke the eggs to make the Turkish Republic’s omelet. In early 1926, Mustafa Kemal also sought to bring the manner in which Turkish society was regulated into line with European countries. On 17 February 1926, the Turkish parliament approved a new civil code which was translated almost verbatim from the civil code in the Swiss canton of Neuchatel. The changes it introduced included: granting Turkish citizens the right to choose their own religion, thus abolishing the previous prohibition on apostasy from Islam; officially recognizing only civil marriage ceremonies conducted by representatives of the civil authorities … outlawing polygamy; making divorce dependent on a decision of the courts; lifting the ban on Muslim women marrying non-Muslims; and granting men and women equal inheritance rights. The new Civil Code was followed by a battery of further legal reforms to try to bring Turkey into line with contemporary Europe. On 1 March 1926, parliament approved a new Penal Code, which was translated from the Italian Penal Code of 1889. A Code of Obligations was introduced on 22 April 1926, again based on the one in Swiss canton of Neuchatel. On 9 May 1926, parliament approved a new Commercial Code, which was largely based on German law. This first of the Turkish Republic’s political assassination attempts and arguably its last serious bid to reverse secularism licensed an efficient purge and further consolidation of power by Atatürk, who over the weeks ahead shattered the remnants of the Unionists and Progressive Republicans and settled in for essentially secure autocratic governance for the balance of his life. The alleged conspirators in the hit — not all of them as eager as Hursit to avow responsibility over the two-plus weeks’ trial — were hanged at a couple different locations in the former capital this date, bearing placards damning them for “attempting to assassinate our President, Mustapha Kemal Pasha, who is the saviour of Turkey’s honour.” One of them had a botched execution with a broken rope and a do-over. * The city wasn’t renamed Istanbul until 1930. On this date in 1961, the Turkish Prime Minister deposed in the previous year’s military coup was hanged at the island of Imrali. 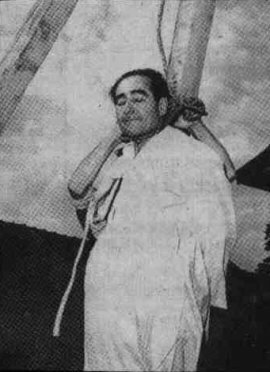 Condemned at the same trial as his comrades in government,* Adnan Menderes delayed his execution with an unsuccessful suicide bid. Revived from a sleeping pill-induced coma, the gag about Istanbul was that he would soon be fit enough to hang. Twenty-four hours and one involuntary stomach-pumping later, and he was. The 62-year-old Smyrna/Izmir native had had a memorable run. He served in Ataturk’s army, then toppled Ataturk’s political party: Menderes won the first three free elections in Turkey in 1950, 1954, and 1957, a feat never since replicated. He was notorious for his temper and sensitivity to criticism, reportedly given to smashing things in his office and demonstrably given to firing ministers and aides for even trifling differences of opinion. Just months before his ouster, he’d survived a plane crash in England — “the former Premier,” observed the New York Times,** “might have gone down in Turkish history as a great patriot and champion of the people” if he had died in it. * Among the co-defendants also condemned but reprieved was Mahmut Celal Bayar, President of the Republic of Turkey. Bayar died in 1986 at age 103, supposedly the longest-lived head of state or head of government in all of history. Part of the Daily Double: Turkey’s “Left-Wing Coup”. On this date in 1922,* on the morning after a revolutionary tribunal held them liable for treason in the catastrophic Greek loss of Smyrna, six former high-ranking political and military officials of the Greek government were shot in Athens. The long-running national conflict between liberals and monarchists had boiled over during World War I, setting the stage for increasingly bitter internecine conflict played out against the backdrop of a misbegotten foreign adventure. Greece’s territorial aspirations after World War I. As the Ottoman Empire — Greece’s neighbor and historical rival — collapsed in the aftermath of the world war, Athens under liberal colossus Eleftherios Venizelos set her sights on a vast pan-Hellenic domain spanning Constantinople, western Anatolia, and the Black Sea coast. In 1919, backed — even pushed — by the British, Greece occupied Smyrna, a multiethnic economic hub in Asia Minor. But cruelty towards the Turkish population sparked immediate resistance which soon blended insensibly into the burgeoning Turkish National Movement, already on the path towards its destiny of forging the modern state of Turkey. As the Greek army pressed outwards from Smyrna, it became drawn into full-fledged war. In 1920, the Greek government turned over (as it was often wont to do) and under the ascendant monarchists whose irredentism was not to be upstaged “fantasy began to direct Greek policy” — like a quixotic scheme to march on Constantinople rather than hold a defensible position. Greece’s European allies and sponsors began to cut bait. September 14, 1922: Smyrna burns. Far from threatening Constantinople, the Greeks suffered one of their greatest disasters — the “Catastrophe of Asia Minor”, when Ataturk drove them back to, and then out of, Smyrna, emptying the once-cosmopolitan city of thousands of Greek (and Armenian) refugees fleeing a sectarian carnage. Some swam out of the burning city only to be refused aid by ships of nations unwilling to be drawn into the affair politically. With two other ministers of state and a general, they comprised all but one member of the offending monarchist government, a bloody thoroughness the New York Times compared to Robespierre. Western governments temporarily broke off relations. After the day’s bloody deeds, Venizelos returned from exile to conclude the war on Turkish terms, including “population exchange” — fragrant euphemism — to solidify each government’s demarcation as a nation-state and ratify the destruction of Smyrna (renamed Izmir) as a multiconfessional melting pot. Even the most ignorant yokel knows that the name Attila is associated with untold horrors and vandalism. But the Smyrna affair, which far outweighs the horrors of the first World War or even the present one, has been somehow soft-pedalled and almost expunged from the memory of present day man. The peculiar horror which clings to this catastrophe is due not alone to the savagery and barbarism of the Turks but to the disgraceful, supine acquiescence of the big powers. Smyrna, like the Boxer Rebellion and other incidents too numerous to mention, was a premonitory example of the fate which lay in store for European nations, the fate which they were slowly accumulating by their diplomatic intrigues, their petty horse-trading, their cultivated neutrality and indifference in the face of obvious wrongs and injustices. *Greece did not adopt the Gregorian calendar until 1923, the last European country to do so — so the date in Greece on the day of the execution was actually November 15.